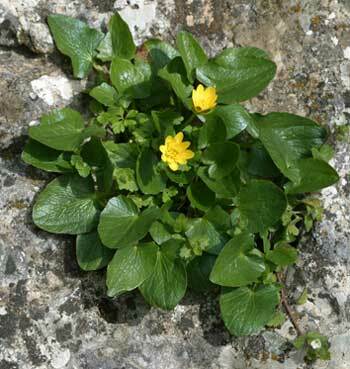 Care must be taken to differentiate between two herbs known as celandine. This evergreen perennial herb produces a small, bright yellow flower; its stems, when broken, emit a milky sap that stains and burns the skin. Has hairy leaves shaped like oak-leaves, yellowish in color. This member of the poppy family has no connection with its better known namesake, the lesser celandine, a cousin of the buttercup. They are different medicinally and botanically. Celandine is anchored in the soil with a strong root. Depending on the habitat, it grows 12 inches (30 cm) to over 39 inches (1 m) tall. All its parts contain a bitter, yellowish milky juice with which people try to get rid of warts and pimples. The orange-yellow juice turns red when exposed to air. Celandine stems are branching, slightly hairy, and covered with hairy alternate leaves. The hollow stem is round, smooth and swollen at the joints. The leaves are bluish-green, pinnatifid at the top and pinnate at the bottom with ovate, mildly and irregularly lobed leaflets. The bright yellow flowers have 4 petals, 1/4 to 1/2 inch across, and numerous stamens and grow in a sparse umbel. The fruit, which burst open by means of 2 valves, contains black seeds with a white appendage. The finger-thick cylindrical rootstock is red-brown on the outside, orange-yellow inside, contains the bitter, milky juice. Celandine blooms from March to the end of November: the primary blooming season is during the months of May and June. 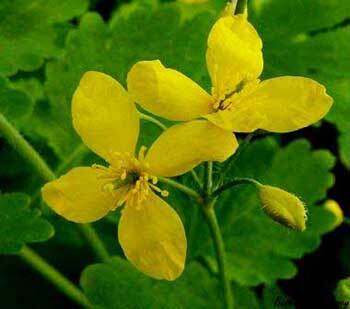 This is the better known herb by the name of celandine. The bright yellow flowers grace the hedgerow every spring. Its leaves are heart-shaped and often speckled with blobs of black or purple. Of more interest is the root, which sprouts a number of cylindrical tubers; these pile-like nodules were taken to suggest that the plant might cure hemorrhoids, hence its other name, the pilewort. Flowers March to April. Found in hedgerows and wastes. Introduced into this country from Europe, it now grows principally along walls, paths, and fences and in landfills. Celandine seeds have an appendage that ants find delicious, so they carry the seeds and plants can be found anywhere as a result. Celandine is not highly recommended for growing in the backyard garden. If it finds its own way in and turns up along fences or old garden walls, count on its appearance every year, since it is a perennial. Found in moist corners of fields and places that are near water, yet will grow in drier ground if it is slightly sandy. Chelidonium majus has been used in medicine for an extremely long time. In the writings of the Greek philosopher Theophrastus (372-287 BC), he tells that celandine is useful in treating jaundice, liver disease, constipation, and gallstones. These findings also entered into the medieval herbals, from which folk medicine draws its knowledge. 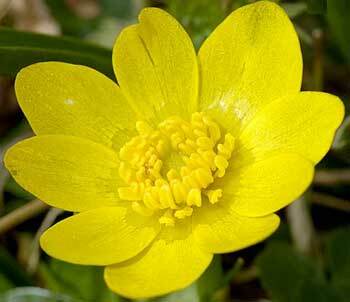 Celandine was used in folk remedies to relieve abdominal distress; and is currently being tested as a cancer drug. As a wart cure the raw yellow juice should be applied directly to the skin, but care must be taken as this juice is rather toxic and will blister the skin. Skin can be neutralized with diluted vinegar and water. It is necessary to point out that celandine tea by itself is seldom used any more. Instead, celandine is an active ingredient of teas for the stomach, intestinal tract, gonorrhea, constipation, cough, gallstones, neuralgia, chorea, diarrhea, rheumatism, nose bleed, pneumonia, whooping cough, jaundice, and liver. The fresh juice mixed with vinegar may be applied for removal of warts and corns. It may also be made into an ointment to be used on various skin diseases, such as ringworm, eczema, tetters, skin cancers, and skin tuberculosis. Despite doubtful reasoning, it remains true that an ointment prepared from the crushed root will stop the discomfort from piles. For extra benefit, add stonecrop (Sedum album) or toadflax to the ointment. The same preparation will also heal boils, old wounds, ulcers, scrofula, sores, and painful whitlows (a painful infection at the end of a finger or toe near the nail). As the name pilewort suggests, this herb treats hemorrhoids. Gather the rootstock in spring, before the plant flowers. Use with extreme caution; preferably with medical direction. The dried plant is less active than the fresh. Infusion: use 1 level tsp. rootstock or herb with 1 cup boiling water; steep for 30 minutes. Drink cold, 1/2 cup per day. Tincture: a dose is 10-15 drops. Juice: for warts, dab no more than 2 or 3 warts at a time with fresh juice, 2 to 3 times per day. Do not give this herb to children. 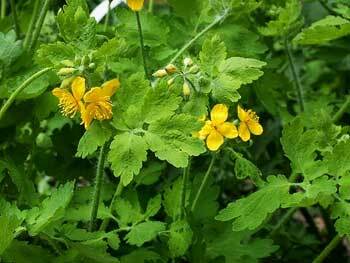 Do not confuse greater celandine with the small or lesser celandine herb. Strong doses are harmful, due to the caustic properties of the plant. Skin poisoning has been reported from handling the crushed plant. Toxic: Stem juice highly irritating, allergenic, may cause paralysis. Its use is not recommended without medical supervision.